Giving new meaning to the term, “digging deeper,” a group of Rye residents recently uncovered pieces of Westchester’s rich history. In an archaeological dig at the Jay Heritage Center, locals had the rare opportunity to unearth never-before-seen artifacts on a national historic landmark. Formerly the home of one of our nation’s founding fathers, John Jay, the Jay Heritage Center has been the host site of many archaeological digs since its establishment approximately 20 years ago as a national landmark, nearby on Rye’s Boston Post Road. However, the center’s most recent dig, conducted earlier this month, was the first of its kind‑an archaeological dig open to interested volunteers of all ages. Unlike most historical sites, the Jay Heritage Center involves the community in efforts to preserve, restore, and uncover history. “This is history you can reach out and touch. This is what books are written about,” said Heather Craane, director of programs for the Jay Heritage Center. A small sampling of the artifacts discovered by Rye science teacher John Griffin during the dig at the Jay Heritage Center from Aug. 1 to Aug. 7. 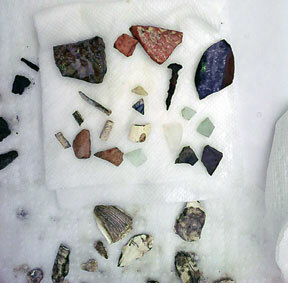 Led by archaeologist Eugene Boesch, the group of approximately 12 volunteers uncovered artifacts including pieces of brown and blue slipware ceramics, an antique coat button dating back to the 1700s, a number of square-headed nails‑evidence of primitive tools used by Paleo-Indians‑oyster, clam, and cockle shells and some animal bones. Part of the dig was conducted near an old ice house and washing station used by the estate’s servants, which helps explain the number of kitchen and food related artifacts the team found. The group of volunteers, who ranged from age six to more than 40, was purposefully designed to be small so that participants could get the most out of the extremely detail-oriented process. Suzanne Clary, acting executive director of the center, called the dig, “an inter-generational archaeological experience,” a first for the Jay Heritage Center and something nearly unheard of in the archaeological world. 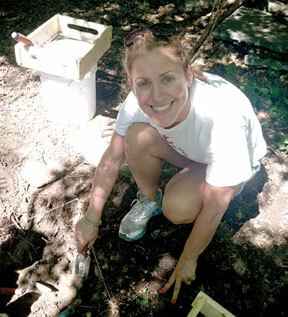 Rye resident Catarina Cabrera participated in the dig along with her two daughters, Julia, 7, and Sofia, 9. “The Jay Heritage dig gave my girls much more than a few good days of digging in the dirt, it gave them a sense of history that no book could have conveyed,” she said. Rye Resident Barbara Berte on site. For seasoned archaeologist Boesch, the staff’s commitment to archaeological discovery makes experiences at the Jay Heritage Center unique for him. Boesch described history as a tree, with extensive unseen roots below ground. Roots only archaeology can carefully uncover. Though the dig was a local community event, the history uncovered from it will be analyzed and recorded on a statewide level. 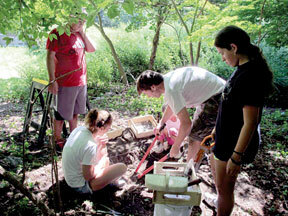 Boesch will detail the findings of the dig in an extensive written and photographic report. The report will then be sent to the New York State Office of Parks, Recreation and Historic Preservation where it will be saved for documentation and analysis. The team is still in the process of cleaning their findings and working carefully to make sure their findings are handled with care. “The whole experience was so accessible. My children and I had a wonderful time,” said Rye resident Barabara Berte. Neither Berte, her children, nor any of the other 12 amateur archeologists had ever participated in a dig before. But, under Boesch’s direction, it was a rare opportunity to combine history, community service, preservation, and education. A close-up of some preliminary findings. 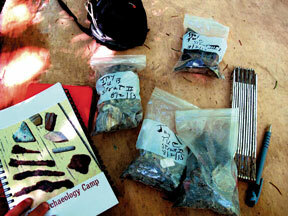 Tags: archaeological, archaeology, dig, history, jary heritage center, john jay, rye, westchester. Bookmark the permalink.